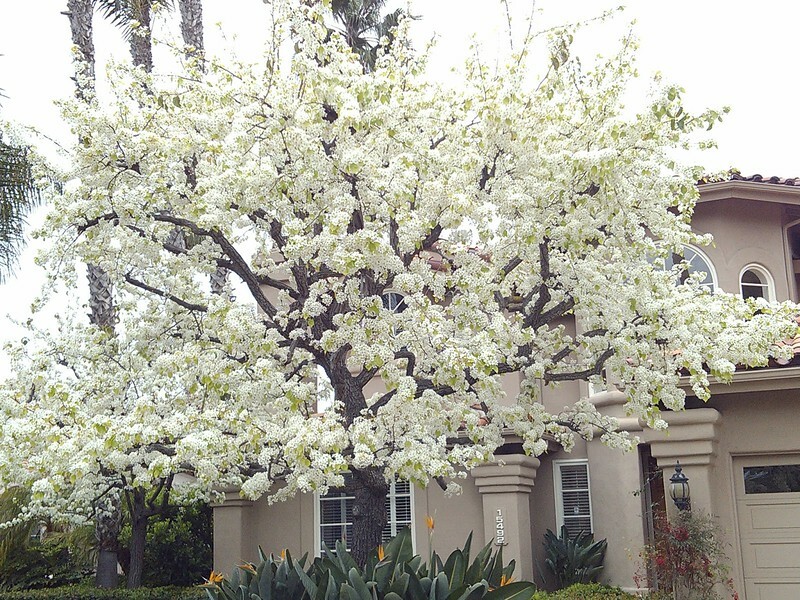 TREES - Sacred Space Garden Design, Inc.
Pyrus kawakamii (Evergreen Pear) - An semi-evergreen tree with glossy, oval, pointed leaves of medium green. Winter foliage is red. Clustered fragrant white flowers appear in sheets and masses in winter to early spring, short-lived but spectacular. Small inedible fruit appear in late summer and are bronze green in color. Heavily pruned trees seldom flower. Grows slowly to 15-25 feet with a 10-15 foot spread. Can be trained as a broad, sprawling shrub or multi-trunked small tree Perfect for courtyards, patios and gardens. A very mature tree shown here.